Residents of Wantirna and beyond were recently treated to a fascinating walk and talk at Bateman Street Reserve, Wantirna, where they learned about Indigenous plants and their traditional use in Aboriginal culture. The walk was led by Jamie from Walkabout Education, who was born on the Mornington Peninsula and has a strong bond with the Traditional Owners, the Bunurong. Jamie has spent years with Aboriginal teachers learning the languages and ancient customs of this sacred land, and recently published the book ‘Bush Foods & Survival Plants of South-east Australia’. Participants at this booked-out event gained incredible insight into our indigenous heritage and how plants were used for food, shelter and medicinal purposes . 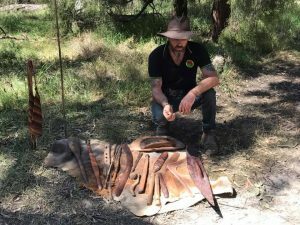 Due to overwhelming demand, First Friends of Dandenong Creek (who organised the event) will be running another Indigenous-themed event sometime in the future. Please keep an eye on their Facebook page for details. This event was supported through Living Links with funding from the Victorian Government’s ‘Our Catchments, Our Communities’ Initiative.